Thank you to everyone that have brought the issues to my attention regarding iOS 7 and FlightScale / FlightPlan template saving. I have already submitted an update for FlightScale to Apple for approval, and will be wrapping up FlightPlanHD this evening. Early next week I’ll have FlightPlan for the iPhone complete as well. It will take Apple a couple days to complete the review process but it should be in your hands soon. From here forward I’ll be building my apps targeting iOS 7, which means the newer updates will only be available for devices running iOS 7. I believe the impact for users here will be minimal because iOS 7 will work on many older devices, and also because Apple allows users to download the “latest compatible version” for whatever version of iOS they may be running. Please reach out to me if you have any further issues going forward. Thanks again everyone for your patience. I’ve been making pretty good progress enhancing FlightScale on Android. This app just got a basic version of the Helicopter Template that allows you to calculate both a longitudinal and lateral CG. Also, “Email Report” functionally has just made its way in! If you haven’t checked it out in awhile take a look, and feel free to send me feedback! Lateral analysis and graphing for FlightScale! I finally have lateral envelope analysis integrated in to FlightScale! The helicopter template will now allow the user to define a longitudinal and lateral envelope and test against both to let you know if you are within the limits or not. The Email Report feature will also display both graphs and details for you to send out. Thanks everyone for the feedback. More great stuff to come. Helicopter pilots will be happy! I have almost completed an update that I know helicopter pilots have been waiting for…lateral plot and envelope analysis! There will be a smaller update hitting your devices within the next few days. After that, I will be finishing up the lateral plot and envelope analysis changes and submitting them. Then, it is just a waiting game until Apple approves the updates. More stuff to come. Thanks everyone for your patience while I work on your requests. FlightScale has seen a good amount of attention lately. It just got the “Email Report” feature and has already received an update to enhance that further. It’ll get more improvements down the line too, but for the most part people seem to be happy with it so far. Another large issue I have been needing to address is the ability for helicopter pilots to define “Lateral Envelopes”. I believe this will be coming soon; I’ve started taking steps to prepare for this feature. Before I tackle lateral envelopes, I decided to redesign how I handle limits in the software. While the interface to the user will remain very much the same, “under the hood” things are changing significantly. The end result will make it much easier for me to change and enhance limit related functionality. Also, you’ll be getting more limit points available to you too (which will make some of you happy). After the lateral envelope feature, I want to enhance the “Non-linear Fuel” feature further. Specifically, I’d like to make it so every fuel entry can have its own non-linear fuel table specified. So, that is what is on my plate right now for FlightScale. Thank you to all of the users that provide feedback, and to those of you showing off the software to your friends and colleagues. Your support is appreciated and helps insure continued developement. I have just cut builds of both FlightScale and FlightPlanHD (containing the new FlightScale) and submitted them to Apple for approval! I expect these should be approved within the week! This first implementation of the Email Report will provide basic data, such as the summary of the resulting weights / CGs and the plot, and allows you to type in extra data if you wish. All of this will be shipped off (via email) to you, your employer, or whomever you send it to! I’m looking forward to feedback to hear what other data people would like in their reports. I expect to be expanding on the options of this reporting feature quite a bit in the coming months, so send me your feedback! Here are a couple screenshots to show you what it looks like! (Please note that the data in the following screenshots is not guaranteed to accurately represent a Piper Seneca. Values may have been changed during testing and may not reflect a real aircraft). 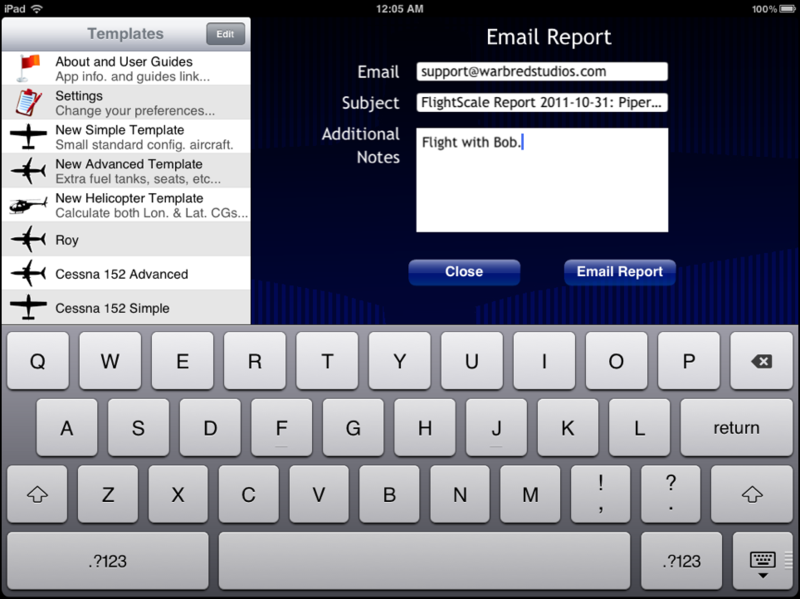 FlightScale (and FlightPlanHD) will finally be getting the ability to send an email report of your Weight and Balance. This feature has been in my “to do” list for quite some time and I’m happy to say it is finally coming soon! 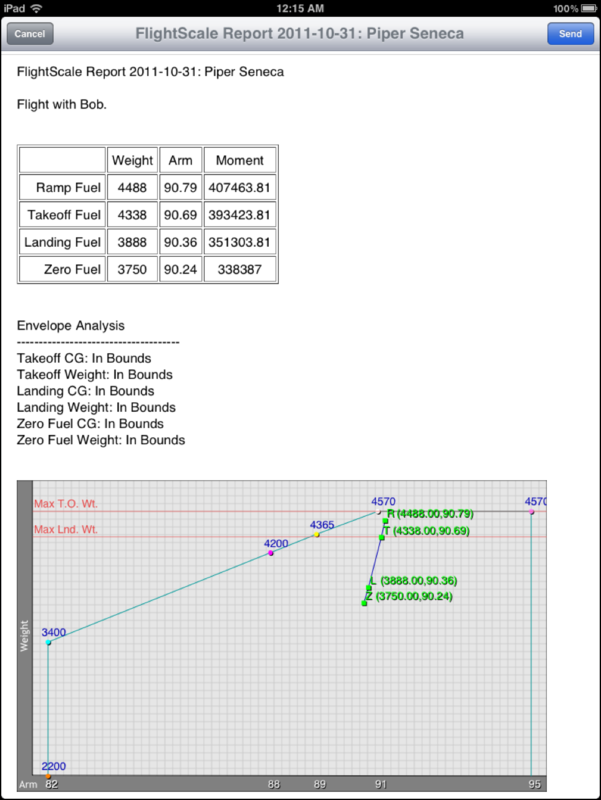 The report will contain the CG Plot Graph with your Ramp, Takeoff, Landing, and Zero fuel points in your envelope, as well as the text values of the points. I know a lot of people have been waiting for this feature for some time now and I sincerely appreciate your patience. I do not have an exact ETA of when to expect the update, but likely in a few weeks it should be out. Watch either this DevBlog or @WarbredStudios on twitter for updates on when to expect this feature to go out. The update for FlightScale I have been working on is almost ready to go and I will be submitting it very soon. I wanted to mention that I have improved how FlightScale handles Landing Weight. Ability to specify a utility / acrobatic envelope (for visual purposes). Improvements to landing weight entry. Ability to provide Ramp Burn and Trip Burn values. More goodies for FlightScale Coming! As some of the followers know I have been working on adding the Utility/Acrobatic envelope definition to FlightScale and am almost done with it. While I’m knee deep in the code I’ve decided to try to get even more features integrated for the next release. You can look forward to being able to define a “Ramp Burn” for fuel. This is the amount of fuel you burn during your taxi and run-up. Also, you can now define a Max Ramp Weight as well as a Max Zero Fuel Weight along with the Max Takeoff and Max Landing weight already provided. If you provide a “Ramp Burn” value you will see up to 4 dots on your plot now. An “R”, “T”, “L”, and “Z” (for Ramp, Takeoff, Landing, and Zero Fuel). It is all still in the works, but I hope to have this update wrapped up and submitted to Apple very soon. Stay tuned! I have been working hard to integrate more functionality in to FlightScale and FlightPlanHD. I’ve had requests to allow a utility/acrobatic envelope definition to be added to the plot alongside the normal plot. I’m happy to say it is coming along nicely! The interface for entering the new envelope will be familiar to current users. On the top of the limits list there is now a selection control where you can switch over to define the utility category. It is important to note that the utility envelope is passive in that it won’t automatically check if you are in or outside of it. It is a visual aid that will plot in your graph so that you can visually do the checks yourself if you want to. Even though the feature isn’t complete yet I want to give you a sneak peak at what it may look like. Please note that the interfaces may change before release and that this is a sample only and does not represent actual Cessna 152 Utility Envelope data. The passed couple months I worked heavily on FlightLog to get the new backup/recovery system in place. That feature has been a big success with users and I’m glad to finally get this frequently requested feature integrated. I now want to get some updates available for my other apps, and the next up is FlightScale! I have just submitted the first of a couple updates I plan to get done over the next few weeks. This update, 1.5, will allow you to expand your plots to full screen so you can get a good look! Also, you can define a max forward and aft center of gravity in all of your templates! I’m anticipating this update will hit your iPads sometime around the first weekend in March. Thanks everyone for your feedback. Keep it coming and I’ll do what I can to get it integrated. It has been awhile since I have updated this blog. Life has been quite busy lately and I’m hoping it will calm down a bit after the holidays. One thing that I have been working on that I wanted to share with you is support for Non-Linear Fuel CGs! This will allow you to enter the table of data from your POH for the fuel trends as the fuel weight changes, and FlightScale will now plot the CG changes for your fuel tank from full fuel down to empty! Also, when you enter a fuel weight (or landing fuel weight) it will look up the CG from the table and fill it in for you automatically. It is important to note that these enhancements can only be applied to the longitudinal CG at this time. A number of other improvements and interface tweaks are on the way soon. Stay tuned! Below is a sample screenshot of FlightScale showing a plot using the new variable CG feature (note that the upper bounds of the envelope for the aircraft have been reduced to make relative plots larger). 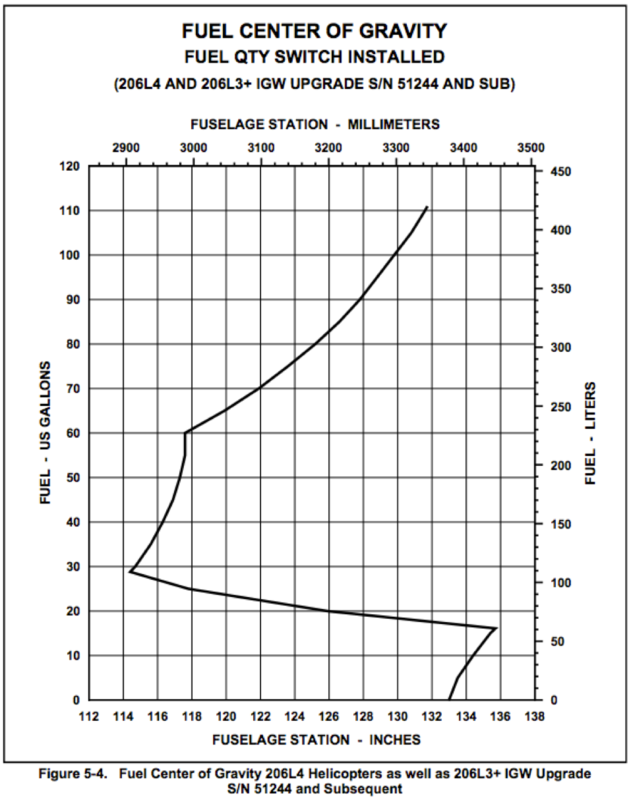 Compare the yellow line on the graph, which shows how the actual longitudinal CG varies with fuel consumption, with the graph of the Fuel Center from the POH for this aircraft. Notice the similar trend in the two graphs. 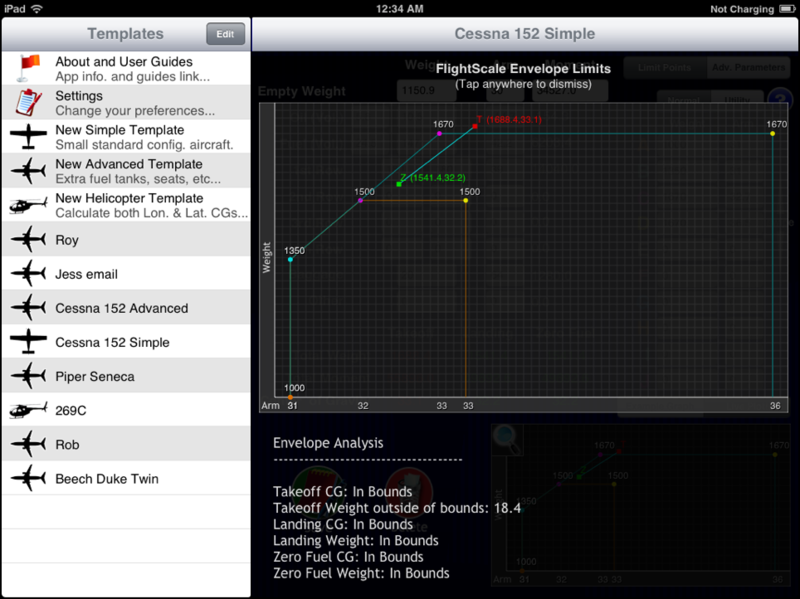 I have just submitted FlightScale 1.2 to Apple for approval. Not sure how long it will be before Apple pushes it out, but this will be a good update! 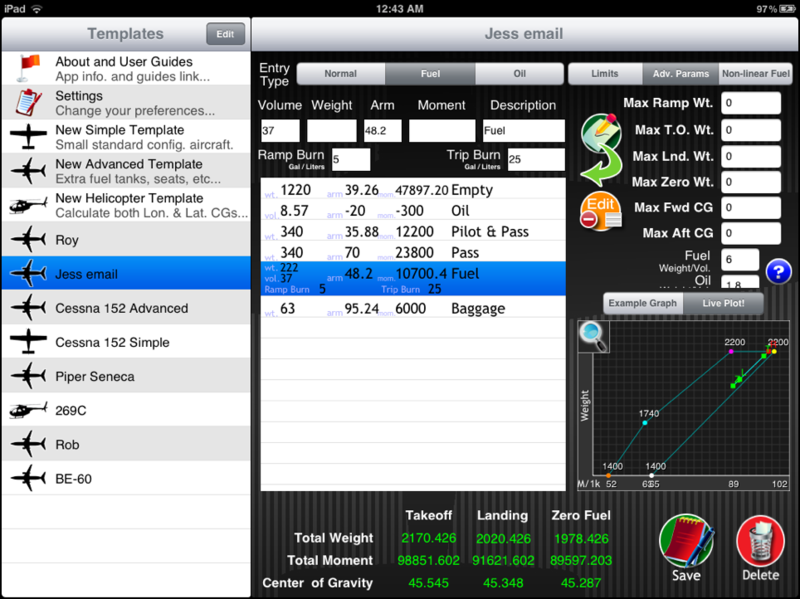 One of the biggest additions is that you can define landing weight for your fuel tanks! 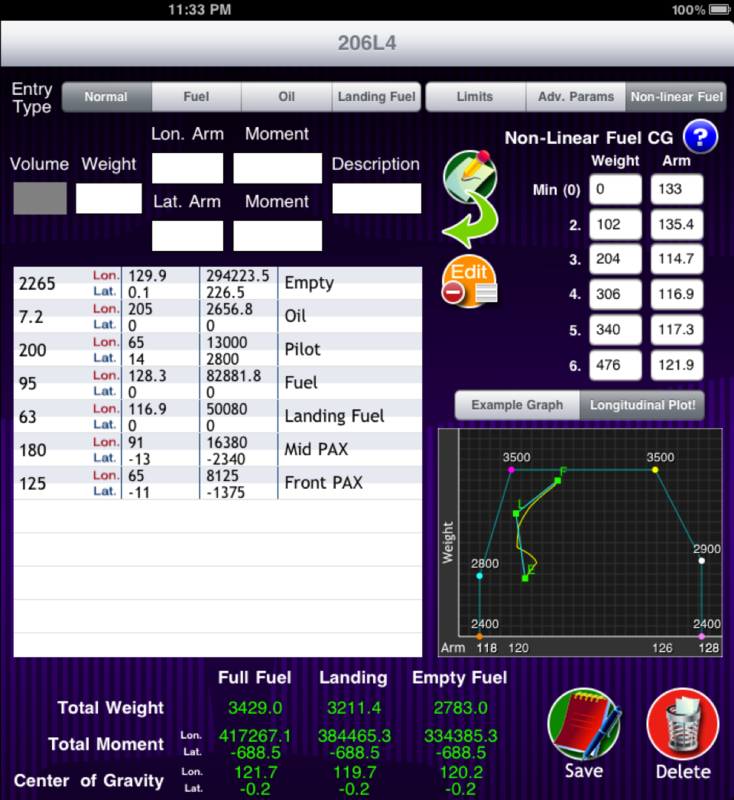 Your plot graph will now show you 3 points, your Full Fuel, Landing Fuel, and Empty Fuel. Not only that, but your graph will label values to your envelope points so you can see the thresholds easier. You also will now have up to 12 limit points to work with! You can now define a Max Takeoff Weight and a Max Landing Weight, each will show a horizontal line on your graph for reference. Good stuff, right? There will be more to come! Thanks everyone for your input. If I haven’t gotten your requests integrated yet I’ll be working on them soon. 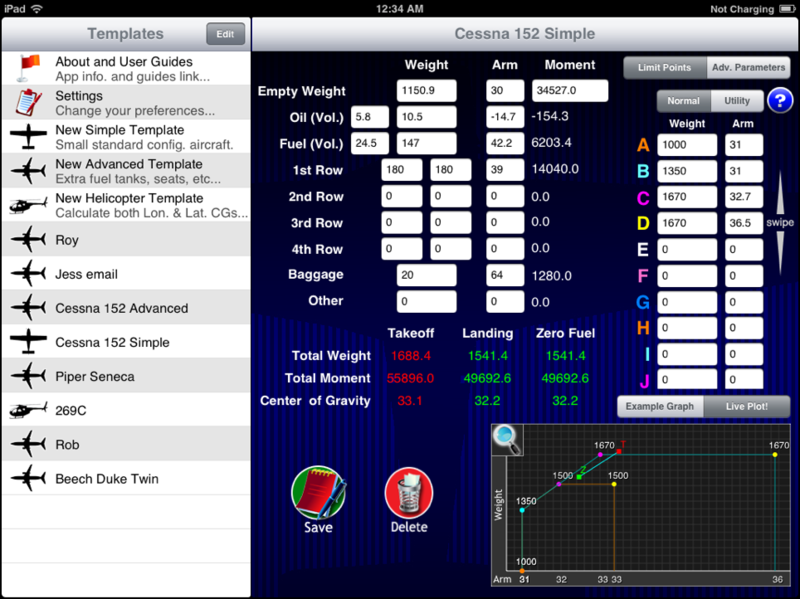 I have just submitted the v1.1.0 update for FlightScale on the iPad. This version brings with it the helicopter template which allows for the center of gravity to be calculated for both the longitudinal and lateral axis. Plotting your limits currently only occurs for the longitudinal axis. This update contains a few other minor updates. More information can be found at the forums. It will likely take a few days for Apple to approve this update, unfortunately. But it’s coming, I promise! 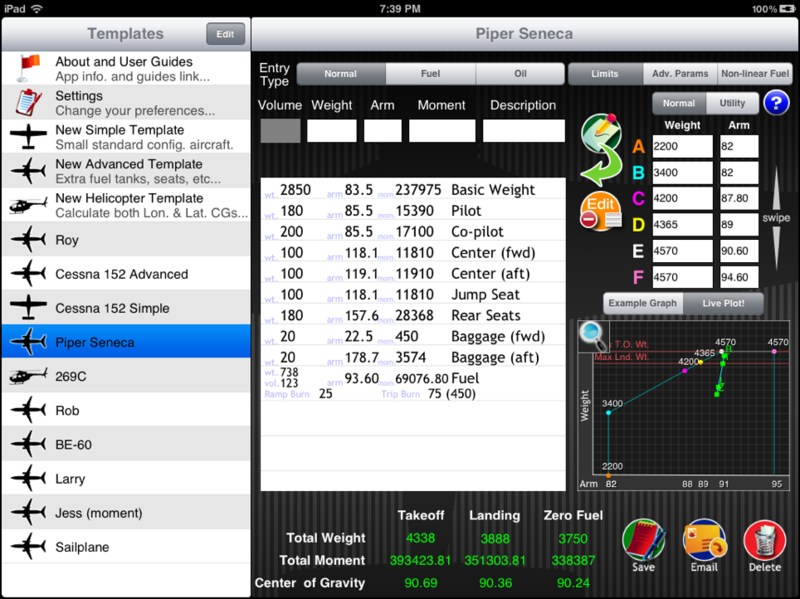 FlightScale has been released for the iPad! 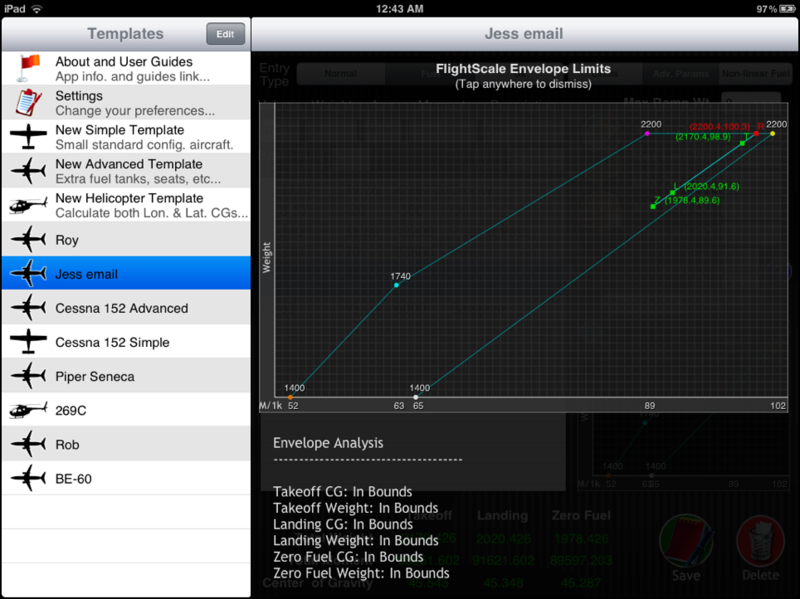 FlightScale takes the core Weight and Balance functionality from FlightPlan and brings it to a beautiful large screen! There is plenty more on the way for FlightScale. I’m planning to get helicopter support integrated, and email reports integrated as well. I’ll then bring this functionality over to the iPhone version in FlightPlan too.